To the disappointment of Indian cricket fans, Irfan Pathan walked out with Gautam Gambhir. How Pathan is in the team itself is debatable – and he opens at the cost of Virender Sehwag ? Inexplicable !!! Aussies responded with another surprise – Glenn Maxwell bowled the first over. It is rudimentary – you have 120 legitimate deliveries and boast of a line up of Kohli, Rohit Sharma, Yuvraj, Dhoni, Ashwin and Harbhajan – and you send Irfan Pathan to open out – a pinch hitter ? - if Virender Sehwag is to be kept out, then perhaps Tiwary could be tried to open even or the vastly talented Rohit Sharma could be the sacrificial goat. Kevin Pietersen just said he feels sorry for him. India won the toss and spoiled it by opening with Pathan, who was totally ill at sea struggling against all bowlers – fans sighed heave of relief when he finally got out – but so also others getting out !! Earlier to compound to the miseries, Gambhir innovated another way to get out – a poor judgmental run – Pat Cummin’s footwork doing the trick. Dhoni reportedly said at the toss that all spinners [Ashwin, Harbhajan and Chawla] can bat and now it is up to them to salvage something with the bat and turn their hands. Sad there is more of loss of life as fire accident is ravaging the beautiful Sivakasi. Sivakasi, in Virudhunagar District of Tamilnadu is the undisputed capital of India’s firecracker industry with about 8,000 factories, big and small, producing 90 percent of the total fireworks output. Hailed as ‘kutti Japan’ – this place is also known for litho printing press and calendars. Firstpost reports that 3 persons were today charred to death and an equal number suffered burns in a fire mishap at an illegal cottage fireworks unit, barely three weeks after a devastating blaze in a cracker unit claimed 39 lives. The mishap occurred at a cracker manufacturing unit in Vijayakarisalkulam near here, police said. As one would sadly recall, on 5th of Sept. 12 a major fire in a cracker unit at Mudhalipatti near Sivakasi, the country’s fireworks hub, claimed 39 lives. The victims were largely villagers, curious onlookers - from nearby places, who rushed to the site on hearing of the accident. The first explosion at the unit, one of the biggest in the region, was reported at 12.20 p.m. Villagers of Mudalipatti and workers of a nearby blue metal crusher unit rushed to the spot. A small posse of police tried to prevent the villagers from entering “Unexpectedly, there was a huge explosion around 1 p.m. and the debris that flew across a wide distance injuring many and killing some. Many of the working sheds were damaged as a strong gust of wind fanned the fire. The injured, who were rescued by the villagers, were rushed to the government hospitals. Later an enquiry was ordered into the incident and Police reportedly arrested 11 employees of the fireworks factory. With sadness – S. Sampathkumar. So what a match it turned out to be – the first of the Super 8 played at Pallekele today. First it was a tie and then more drama was to unfold. It was a razor sharp finish, a freak one at that, that ensured a tie. Do you know, how the result would be decided, if the 2 teams were to be locked after the Super over too ? Even going by the fancy names that Lankans have – the two who played today, is too difficult to pronounce. They were :Mahamarakkala Kurukulasooriya Patabendige Akila Dananjaya Perera + Narangoda Liyanaarachchilage Thisara Chirantha Perera. Simply Dhananjaya, another unorthodox spinner 18 years of age who debuted today and Thisara Perera, who was to play in the Super over. Akila Dananjaya took a wicket off his first over and ended up 2/32 in 4. Chasing 174, Dilshan’s blitzkrieg ensured almost a win – 8 were required of the last Southee over with Angelo Mathews and Thirimanne at the crease. 3 singles of first 3 and it got reduced to 5 off 3; 4th was a dot ball – when you thought of Kiwi emerging, Thirimanne picked it from outside off and hit a four – single off the last ball – now Lankans with chance – off the last delivery, the throw from point deflected of Taylor’s hand to hit the stump having Thirimanne run out, scores tied and Super Over in play. This is the seventh Twenty20 to end in a tie. New Zealand have been involved in four of the seven. It is also the second tie in the World Twenty20 after the game between India and Pakistan in 2007. As it boiled down to Super over, as per the rules both the teams had to nominate 3 players – the best lankan player on view, who was to be the Man of the Match, was nominated but got to play a single ball. In walked Mahela Jayawardene not with Sangakkara but with Perera. Tim Southee was the bowler. First ball – 2; 2nd a single, 3rd wide, then 2 to Perara, 4th 2 wides and a single and Mahela run out; Dilshan came- , 5th leg bye and off the final 3 were run – so14 Was the target. In the mad mad short version, not a single boundary in that decisive 2 overs – strange but true. Tillakaratne Dilshan, who had scored 76 off 53 set himself under the ball at long-off, turning side ways to make sure he knew where the boundary cushions were - they were six inches from his toenails - and took the catch after the ball had passed his body and had almost entered the air space beyond the boundary. Had Dilshan missed that, this Martin Guptill hit off Lasith Malinga would have left New Zealand needing two off the last ball of the Super Over. The catch sealed Sri Lanka's win. The Super over also known as Eliminator comes in to play in T20 when scores are tied and when result is required. It replaced the ‘bowl out’ method for breaking a tie. For the Super Over, each team nominates three batsmen and a bowler. The team that scores the most runs in its Super Over is the winner of the match. A team's Super Over ends if it loses two wickets. The team batting second in the match will bat first in the one over eliminator. The same ball (or a ball of a similar age if the original ball is out of shape or lost) as used at the end of the team’s innings shall be used for the “extra” over. According to ICC playing conditions, in the interesting event of teams having the same score after the one over per side eliminator has been completed, the team whose batsmen hit the most number of boundaries combined from its two innings in both the main match and the one over per side eliminator shall be the winner. If the no. of boundaries hit by both teams is equal, the team whose batsmen scored more boundaries during its innings in the main match (ignoring the over per side eliminator) shall be the winner. If still equal, a count-back from the final ball of the one over eliminator shall be conducted. The team with the higher scoring delivery shall be the winner. He is the very definition of martyr and would eternally motivate the youngsters for the Nation Cause. Before that have you heard of Kartar Singh Sarabha. In the leaflet he threw in the Central Assembly on 9 April 1929, he stated: "It is easy to kill individuals but you cannot kill the ideas. Great empires crumbled, while the ideas survived. While in prison, he and his 2 friends wrote to Lord Irwin, asking to be treated as prisoners of war and consequently to be executed by firing squad and not by hanging. He declined to sign letter for clemency……. - that is Shaheed Bhagat Singh – who was born this day 105 years ago. Bhagat Singh, Rajguru and Sukhdev were sentenced to death in the Lahore conspiracy case and ordered to be hanged on 24 March 1931 The execution was fixed on 23 March 1931. Singh was informed that his execution had been advanced by 11 hours on 23 March 1931, just a few hours before his execution. 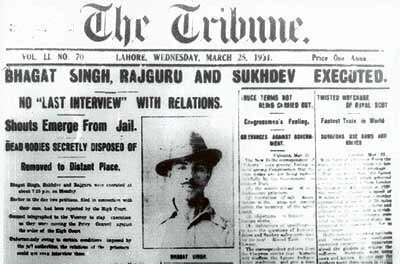 Singh was hanged on 23 March 1931 at 7:30 pm in Lahore jail with his fellow comrades Rajguru and Sukhdev. It is reported that no magistrate of the time was willing to supervise his hanging. The jail authorities then broke the rear wall of the jail and secretly cremated the three martyrs under cover of darkness outside Ganda Singh Wala village, and then threw the ashes into the Sutlej river. An ex-parte trial was against the principles of natural justice that no man shall be held guilty unless given an opportunity to defend in a hearing. It was probably for the first time, that executions were carried out in the evening, by advancing the date of execution. The families of the accused were not allowed to meet them before the execution nor were they informed about it, even the bodies of the three were not given to their relatives after the execution to perform last rites, but were removed by demolishing the rear wall of the jail since there was an angry crowd at the front gate and were disposed off by cutting them into pieces and burning with the help of kerosene after which the remains were thrown into Satluj river. Years after the sad historic event, now it is reported that social activists from India and Pakistan will jointly celebrate the 105th birth anniversary of legendary revolutionary Shahid-e-Azam Bhagat Singh in Lahore on September 28. However, what may play spoilsports is delay in giving of visa by the Pakistan to 32 member Indian delegation, which includes 18 persons from Uttar Pradesh (UP). Indians however are hopeful they will get clearance) and join celebrations on September 28. The Indians activists along with their Pakistani counterparts, if allowed, may also visit revolutionary's village Bangha in Jaranwala tehsil of Lyallpur district. The celebrations are being organised by the Bhagat Singh Memorial Committee in Pakistan and it will be held at at Shadman Chowk in Lahore where the revolutionary was hanged to death by the British colonial rulers. The Labour Party of Pakistan has already demanded its government to rename Shadman Chowk after Bhagat Singh. Apart from the Labour Party of Pakistan, more than 40 civil society organisations and workers/labour unions will participate in the celebrations. The activists feel that colonialism has been replaced by economic imperialism which can be countered only by reclaiming the revolutionary socialist legacy of Bhagat Singh and his comrades-in-arms, Sukhdev, Rajguru, Sohan Singh Josh, Chandarshekar Azad, Ajay Kumar Gosh, Yashpal and others. It was decided that events associated with these revolutionaries will be celebrated to motivate people of the two countries to join the struggle against the imperialism. Bhagat Singh’s mentor as a young boy was Kartar Singh Sarabha, whose photo he always carried in his pocket. Kartar Singh Sarabha (1896 – 1915) was an Indian revolutionary who was amongst the most famous accused in the Lahore conspiracy trial. A leading luminary of the Ghadar Party, Kartar Singh was executed at Lahore in November 1915 for his role in the Ghadar Conspiracy in February 1915. Sri Lankan President Mahinda Rajapaksa, visited India held talks with our PM Manmohan Singh. At Sanchi, he laid the foundation stone for a University of Buddhist and Indic Studies where Bhutanese Prime Minister Jigme Y. Thinley was also present. There have been protests in Tamilnadu and MDMK leader Vaiko led a group but was arrested on way to Sanchi. During the official meeting, India raised the issue of integrating Sri Lanka’s minority Tamils into the national mainstream. The issue of Sri Lankan Tamils is a sensitive subject in India given that India’s more than 60 million Tamils share close cultural and linguistic ties with the ethnic minority on the island nation. There is innate feeling in Tamilnadu that Sri Lanka’s government headed by Rajapaksa—belonging to the majority Sinhalese community—of doing little to integrate the Tamil minority into the national mainstream more than three years after the end of the three-decade-old civil war in the island nation in May 2009. We certainly feel for the Tamilians of Sri Lanka – the Civil war was brutally decimated; there have been instances of human rights abuses, arbitrary detentions and forced disappearances. This post is on a different aspect which has happened somewhat frequently in Tamil Nadu in particular. In the State, there are political parties and pro-Tamil outfits often fanning illwill – and there have been instances of people self-immolating for the cause. There sure are sentiments for the tamilians but what happens to the one who sacrifices himself for the cause – does he care for his family – is that a momentary decision and finally does it ever have the desired impact on the Society !! Self-immolation refers to setting oneself on fire, often as a form of protest or for the purposes of martyrdom or suicide. Self-immolation of the type that happens in Tamil nadu is in no way simple suicide – it is not losing one’s will power momentarily and giving up one’s life – there is world of difference that separates the self-immolator from the others. His total defiance of the survival and self-preservation instincts, his determination to give away what everybody else finds precious. Often people immolate themselves when their leader gets arrested, on sentimental issues and even when their leader has a natural death. Protesting against the recent visit of Mahinda Rajapaksa, a 26-year-old auto driver from Salem attempted self-immolation and subsequently succumbed to burn injuries. T Vijay Raj, an auto driver from Salem, set himself afire near the old bus stand protesting Rajapaksa's visit. Police rushed him to the Mohan Kumaramangalam Government Hospital with 90% burns. The man’s father tearfully stated that his son was the sole breadwinner of family. The tragedy of Tamils in Sri Lanka is an emotive issue that fringe parties in Tamil Nadu periodically use to rally pro-Eelam sentiment. After the death of the poor auto driver, there were more than one party which claimed that the deceased was an active member of their party ~ some trying to cash on the sentiments following the death. Raj's relatives and members of political parties, including MDMK and VCK, refused to allow the hospital to conduct a postmortem on his body. They staged a sit-in protest at the hospital, demanding an FIR against Prime Minister Manmohan Singh and Congress president Sonia Gandhi. Police personnel attempted to pacify the protesters but the demonstration continued till late evening. Seeman, founder of pro-Tamil outfit Nam Thamilar Katchi, visited the hospital and offered his condolences to Raj's family. Marumalarchi Dravida Munnetra Kazhagam leader Vaiko visited the family of Salem autorickshaw driver T.P. Vijayaraj, offered condolences to the aggrieved family members and handed over a cheque for Rs. 2.25 lakh. He also garlanded the photo of Vijayaraj and interacted with the family members. Often the families of leaders of Political parties live affluently and enjoy all benefits of life – it is always the workers at the grassroot level who suffer for all the cause – this is in general and not against any party in particular. The families of the deceased are often left in lurch – the parents would suffer more at their old age having lost their beloved son; the wife and children also would languish financially and for lack of support – such deaths no doubt throw the family in wilderness the chill penury. Is there really anybody who cares or even condoles for such death after passage of some time. It is time leaders condemn such acts, never eulogise such acts as bravery and ensure that their cadres also live happily. The comparison may be invidious – a mighty ship with a lowly bird – but OSM Arena and Emus are suffering a similar fate – no owner to claim for, no body to maintain and take care, nobody willing to maintain, no body to sell and still none to buy – no money – debts keep rising and uncertain future is totally bleak.. The ill-fated South Korean flagged Bulk carrier cargo ship with IMO No. 8411334 and dimensions of 190 M length and 32 m beam with call sign - DSOC5 ‘OSM Arena’ got mired in to troubles one after another is struck below the bow in muddy waters literally and legally. From its and its occupant pathetic conditions, it tried to get loose and came almost closer to the sands of Marina – courtesy very severe cyclonic storm “Thane” that ravaged Pondy and Cuddalore. As posted earlier by me, Chennai was not the happiest of its ‘port of call’ when it arrived here in Jan 2010. Calcutta High Court passed an order that the said vessel should not to leave Portof Chennai without the leave of Calcutta High Court. Orders were passed directing the Custom authorities to ensure that the said vessel does not set sail without leave of the High Court, Calcutta. The vessel which sure had forgotten sailing and perhaps is unlikely to sail more, has been subject matter of litigation in different ways. The vessel was advertised for sale and there were some interested parties but more litigation ensured that sale never fell through, money never changed hands; its poor occupants continued to live in shackles without visiting the shore though close to it, living in pathetic conditions with little food that too coming as courtesy. Sad - the Madras High Court had ordered the sale of vessel and tenders were floated for sale in public auction in "as is where is" condition, free of all liens. The tenderers were to pay EMD of Rs.25,00,000/- Following the floating of tenders, the auction purchaser had deposited 25% of the bid amount and the balance was to be deposited by borrowing from Bank. An amount of Rs.20.68 crores was reportedly deposited by the auction purchaser. As there were more and more litigation, the Auction purchaser stated that he had acted in good faith in submitting a bonafide bid for purchase of the vessel and that because of the protracting litigation and the objections to the sale, they shall mbe permitted to withdraw the bid amount of Rs.20.68 crores including the EMD deposited by the auction and the sale fell through. Subsequently, Madras High Court directed Sea Traffic who had been taking care of maintenance of supplies to the vessel would have first charge for the amount spent by them and asked them to continue maintenance on the grounds that they receive their dues on priority basis out of the sale proceeds of the vessel. A Kolkatta based company LMJ International inevitably got into thick of litigation - from C.S.No.75 of 2011 on the file of Madras High Court, it is understood that this company being aggrieved by the order in A.No.2504 of 2011 in C.S.No.75 of 2011 interalia directing the Appellant/Intervener-LMJ International Limited to pay USD 671,658.24 and also to pay a sum of Rs.50,57,544.90 to M/s.Sea Traffic, the agent, who are now taking care of the supply of necessaries to the vessel M.V. OSM Arena, an appeal was filed. According to it, M/s.Shinhan Capital Company Limited purchased the vessel M.V. OSM Arena from M/s.Sunwoo Merchant Marine Company Limited in Nov. 2009. The ship was leased back to M/s.Sunwoo Merchant Company Limited under the Vessel Lease Agreement. In 2009, there was amended mortgage and the new lessee Ocean Success (OS) Maritime Company Limited [OSM] incurred debt under the mortgage security. By a Charter Party agreement in Aug 2009, the vessel M.V. OSM Arena carried about 43,000 MT Bulk iron ore belonging to LMJ International Limited from Haldia, Paradip, Vizag to a designated Port in China. Vessel M.V. OSM Arena arrived at the Port of Haldia in August, 2009 and completed the loading at the Port of Haldia on 22.08.2009. At Paradip port, dispute and differences arose between the LMJ and the vessel as to the payment of demurrage and issuance of bill of lading. LMJ filed suit before the Calcutta High Court interalia claiming that the bill of lading has been rightfully issued and valid. In Jan 2010, the Appellant filed an application after getting informing that the said vessel was arriving at the Port of Chennai. In Feb 2010, Calcutta High Court passed an order directing the Custom authorities to ensure that the vessel not to leave the Port of Chennai without leave of the High Court, Calcutta. During the pendency of the civil suit on the file of High Court, Calcutta, three of the crew members of the vessel which has been lying arrested in the Port of Chennai filed suit before the High Court, Madras claiming the wages and compensation payable up to 31.01.2011 together with future wages till the date of signing off from the vessel. Remaining crew members on Board the vessel also filed suit claiming outstanding wages due from October, 2010 stating that the owner of the vessel committed breach of contract by not paying the wages as per the respective contracts of employment. Though notice was served on the owner of the vessel, they failed to appear and contest the suit. Since the owner of the vessel failed to appear before the Court, sale of vessel M.V. OSM Arena was ordered by Madras High Court. However that had to be cancelled after Kolkatta HC ordered vessel’s arrest on business dispute. As if all these were not enough, LMJ International Limited filed a Transfer Petition (Civil) no. 665 of 2011 before the Supreme Court of India with application for stay. After some adjournments as no appearance was made on behalf of the petitioner, the Hon’ble Court dismissed the case for non-prosecution by its order dated 9th July 2012. The vessel remained stranded off the city coast since Dec 2010 with none to claim ownership. Now there is news [today’s Times of India – Chennai edition] that the ship OSM Arena stands arrested on fears that it could pose danger to ships during monsoon. The vessel which has become a nightmare since its arrival has made its occupants suffer as there had been blackout and sailors on board starving. Stating that such dead vessels post lurking threat to others passing through, the Chennai Port Officials have arrested the vessel on Tuesday, 25th Sept. 2012. When it was moved away by cyclone Thane, it reportedly had bunker fuel of around 400 tonnes – the vessel lies abandoned and the 14 myanmarese sailors crew on board have not seen the shore in the last 14 months. The International Transport Workers Federation (ITF) is to approach the immigration department for temporary landing permission to take them for a medical check-up. The sailors had been found starving during several inspections by Coast Guard and shipping ministry officials earlier. The vessel reportedly is in bad shape – with anchors, engines and life-saving equipment, including signals not functioning. The newspaper report quotes Chennai Port Trust deputy chairman P C Parida as saying that the vessel will be in the custody of port until November and berth and outer anchorage charges levied from the vessel operator. There had been suggestions earlier to bring the vessel inside the port, but the authorities refused as there was nobody to pay the berth charges. Chennai port is reported to charge Rs.93,000 a day for the berthing. The vessel so far owes the port more than 1 crore for remaining in the outer anchorage. Can we afford to keep Viru out ? - Yeh T20 hai boss ! The minnows have been packed off – now its time for more serious Cricket – the Super 8 stage is set to begin tomorrow. At this stage, there are two Groups A & B each having 4 teams and this would be round-robin stage. In Group A – it is England, the defending Champion, West Indies, New Zealand and Sri Lanka from which 2 teams will emerge for Semis. In Group B, it is Australia, South Africa, Pakistan and India. On 28th we play Australia; 30th we play Pakistan; 2nd Oct, we play South Africa – all these matches at 19.3o hrs at Premadasa Stadium, Colombo. Sure, you did watch the new advertisement from Pepsi for T20 World Cup 2012 – in this new commercial, there are Ranbir Kapoor, MS Dhoni, Virat Kohli and Suresh Raina together on - screen. Pepsi is the global sponsor of the event. The Advt shows how people are crazy about T20. Ranbir Kapoor tells Dhoni - "Yeh T20 hai boss... na tameez se khela jaata hai... na tameez se dekha jaata hai!. – does it literally mean that Cricket is no longer a game. The other Advt also featuring Ranbir Kapoor replacing an fully bandaged person from hospital bed, placing Pepsi on his bandaged hands is seemingly in bad taste !!! - Cricket sure has travelled a long way. There was a time when cricket had a timeless Test – the match lasted for 10 days and only ended because the English team had to leave the ground to catch the boat back home. Even in India, I have watched 6 day matches – then Tests with a rest day in between. In Australia, New Zealand there were overs with 8 balls. When we toured Kiwis in 1976, under Bishan Bedi, it was 8 ball affair. The ‘Timeless Tests’ had to be scrapped because they were dull, boring and threatened to destroy the sport. It was by a sheer accident in 1971 that One day International was born. The Prudential World Cup 1975 was a super hit and was sought to be replicated once in 4 years thus happening in 1975; 1979; 1983; 1987; 1992; 1996; 1999; 2003; 2007 & 2011. The very existence of Test and more of ODI seem to be threatened by ECB’s innovation which was played on 17th Feb 2005 for the first time on International level – the match when Australia defeated New Zealand – the T20. - that can be stretched to unimaginative ludicrous levels was demonstrated on Group C clash between Sri Lanka and South Africa. A highly anticipated match between two of the tournament heavyweights, reduced to a farce by the broadcasters. 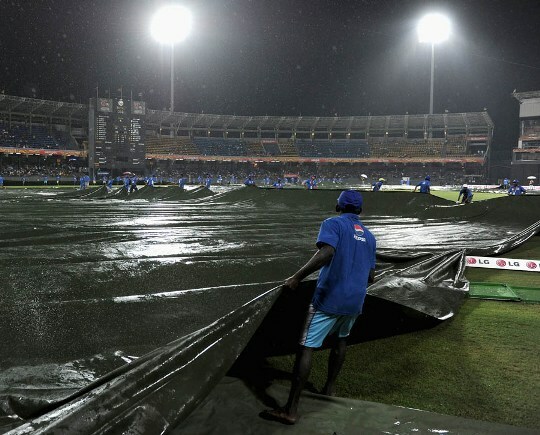 Scheduled to begin at 3.30pm (local time), in the southern town of Hambantota, rain caused a delay. By the time the ground was fit for play, it was still only about 5pm but, rather than a full match, the teams were told they were having a seven-over-a-side slog. This was not because of the threat of more rain or because it was now late at night. No, the teams were sent into this ridiculous spectacle because there was another game in Colombo scheduled to start at 7.30pm. Clear that TV and advertisers call the tune more than the game’s administrators. With a total of 34 advertisers, including the likes of Reliance and Hero MotoCorp on board, ESPN Star has earned the most of advertising revenue, which as per industry estimates is nearly Rs 250 crore. This is the 4th WC and perhaps a gold mine in terms of revenue generated from advertisements and sponsor deals. “The ad rates are upwards of Rs 3.5 lakh per 10 seconds spot,” a source said. The matches are so timed to suit the Indian audience at their peak leisure time. All the 27 matches are broadcast on Star Cricket and Star Cricket HD. Espn Star has also planned a simulcast of all India matches, semi finals and the final with Hindi commentary on its ESPN channel. The company’s presentation team includes ex-cricket stars Sourav Ganguly, Sanjay Manjrekar, Nasser Hussain, Wasim Akram, Ramiz Raja, Tony Greig, Ian Chappell, Mark Waugh, along with other known faces such as Harsha Bhogle and Alan Wilkins. ESPN Star had also sold the syndication rights of the tournament to 218 territories across the world. At the playing arena, after the huge success against England, there is more trouble for Indian selectors and Captain Dhoni. Chawla’s figures of two for 13 in four overs are surely worth a captain’s hug. But sure he won’t play the next. Dinda and Balaji had poor match and can be easily dropped. Zaheer and Ashwin are likely to return…………. But there is more brewing – is there any sinister plan to keep the dashing Virender Sehwag out ? While Rohit Sharma continues to be hailed as the brightest prospect and showered with opportunities, the Nawab of Najafgarh was asked to rest against England, when he needed match practice most. Now there is news that Viru was not part of the nets and perhaps might have to sit out in the match against Aussie as well. The option B is to keep opening with ‘so called all rounder’ Irfan Pathan. Greg Chappell had the game plan of promoting Irfan to No.1 slot, thereby upsetting Sachin, Virender, Ganguly and more. The ghost of Greg continues to haunt, perhaps this time to keep Sehwag out and scare Gambhir too…… a master stroke of Dhoni ? Against England, Irfan did a poor job and most unlikely to succeed against Australia, South Africa or Pakistan. The speculation about Viru’s injury and his keeping away from nets have fuelled theories on whether Viru is sulking and whether he is denied a rightful place. Virender Sehwag is the most destructive batsman on his day - holds multiple records including the highest score made by an Indian in Test cricket (319), the fastest triple century in the history of international cricket (reached 300 off only 278 balls); the fastest 250 by any batsman (in 207 balls against Sri Lanka on 3 December 2009 at the Brabourne Stadium in Mumbai); one of four batsmen in the world to have ever surpassed 300 twice in Test cricket. In March 2009, Sehwag smashed the fastest century ever scored by an Indian in ODI cricket, from 60 balls. On 8 December 2011, he hit his maiden double century in ODI cricket, against West Indies, becoming the second batsman after Sachin Tendulkar to reach the landmark. His score remains the highest individual score in ODI cricket – 219 off 149 balls. The only defence that is sought to be given for Irfan as opener, is that it gives the team a better balance, and the option to play five bowlers without sacrificing one of the in-form middle order batsmen. That won’t pass any scrutiny – Irfan might never succeed as an opener and if you require 5 bowlers, there is no need for 7 batsman – Sehwag is certainly a better bet and excess baggage of a middle order batsman can sure be dropped. If Irfan were to play, he should be playing as a pure bowler – he is no longer pacy and no longer potent force that once he used to be. If he were to play in the present XI that has to be at the cost of Ashok Dinda or Balaji and certainly not as a replacement for the dasher Virender Sehwag ! Away, the Indian team was dope tested - R Ashwin, Harbhajan Singh and Virender Sehwag were taken in for dope testing, perhaps a routine affair. P Chidambaram kin's compound wall demolished - Ignorance of Law !! Sure you have heard this before : Ignorantia juris non excusat or ignorantia legis neminem excusat – a legal principle. As citizens, people are expected to be law abiding and they are expected to know and obey all laws, in addition to state and local statutes and the relevant court opinions that interpret the breadth and depth of all of those laws. Chidambaram Palaniappan, the current FM is a rich man, hails from a rich and educated family. He is known as articulate, intelligent lawyer; has been in politics for long and has been a Minister handling important portfolios during different regimes. His wife, Ms Nalini Chidambaram is also a famous lawyer. Today he is news not for his economic reforms or any Rupee Vs Dollar related thing – but because of a compound wall; demolition of wall to be precise. Newspaper reports state that a compound wall of a plot belonging to family members of Union finance minister P Chidambaram was demolished on 25th Sept.12 morning following complaints from fishermen that it had encroached upon government land. Some fishermen in the locality had earlier complained of the encroachment. A team of revenue officials inspected and measured the 5.4-hectare property by the Karikattukuppam backwaters off the scenic East Coast Road. The land is registered in the names of five people including Chidambaram's wife Nalini and their son Karti. The collector L Chithirasenan is quoted as saying that after measurement of the land, it was found that 10.5 cents of land was encroached upon by them. Advocate N R R Arun Natarajan, who represented Nalini Chidambaram and Karthi Chidambaram, said there was no intended encroachment. "We asked the revenue officials to measure the property as per documents available with my clients and the village records. They measured and informed us that a portion of the wall was outside the land. We immediately demolished the portion of the compound wall," he said. Chengalpet tahsildar M Elango said the land owners arranged for an earthmover to demolish the wall and remove a gate. Elango, who visited the spot, was accompanied by local village administrative officer Prakash and a revenue officer. "The boundary of the property is zig-zag. The land owners should have properly measured their land before building the wall," he said. It is reported in many sections of the Press that Kancheepuram district collector L Chithirasenan, who assumed office early this month, had received a letter from town and the country planning commissioner A Karthik about coastal regulations zone violations by a real estate promoter at Karikattukuppam. Following the report, the district administration had instructed officials to conduct surveys and submit reports before September 27. Constructions along the coast are being monitored by a three-member committee presided by the district collector. Two other members are the deputy director of the Kancheepuram district town and country planning and deputy engineer of the state pollution control board. Ignorantia juris non excusat or ignorantia legis neminem excusat - in Latin means "ignorance of the law does not excuse" or "ignorance of the law excuses no one" - it is a legal principle holding that a person who is unaware of a law may not escape liability for violating that law merely because he or she was unaware of its content. The rationale of the doctrine is that if ignorance were an excuse, a person charged with criminal offenses or a subject of a civil lawsuit would merely claim that he or she is unaware of the law in question to avoid liability, even though the person really does know what the law in question is. Thus, the law imputes knowledge of all laws to all persons within the jurisdiction no matter how transiently. At many places, you see armed sentry guarding the premises, visitors are required to register in a note book, some places there is frisking too – but if you think that security is fool-proof, you are sadly mistaken. Elementary, somebody trying to breach security is not going to provide real identity and hence the notebook with the watch guard recording Name and contact details, without verification of proof, is never going to serve any purpose. Today, the buzz is about a 40-year-old woman, suspected to be suffering from depression, breaching the high-security ISRO campus on old Airport Road here, posing as a senior scientist, and stayed in a guesthouse there for two days. Despite the Central Industrial Security Force enforcing multiple security checks for visitors, Buela M. Sam hoodwinked everyone and enjoyed ISRO hospitality for two days before being found out, police said. How can somebody who has schemed to breach security, stay there and tried to venture beyond, be merely dismissed as ‘mentally disturbed’ – don’t we smell something nasty in this episode. !! The Organisation responsible for soaring India into the sky is – the Indian Space Research Organisation (ISRO). Established in 1969, ISRO superseded the erstwhile Indian National Committee for Space Research (INCOSPAR). Headquartered in Bangalore, ISRO is under the administrative control of the Department of Space, Government of India. ISRO has achieved numerous milestones since its establishment. India’s first satellite, Aryabhata, was built by ISRO and launched by the Soviet Union in 1975. Curious that a woman could so easily be inside and it was only when she tried to venture into another ISRO campus at Yelahanka, that she was caught. When CISF guards stopped her at the entrance, Ms. Sam told them she was a senior ISRO scientist and had come to attend a seminar. Growing suspicious, the security officials cross-checked with the higher-ups and found out that there was no seminar. On further scrutiny, her ID was discovered to be fake. She was then handed over to the JB Nagar police. The police were baffled that Ms. Sam managed to stay at the ISRO guesthouse for two days. “It was a serious lapse as the security personnel needed to have checked her background with the department before allowing her to stay,” said a police officer. Going by newspaper reports, the intruder got into the ISRO Satellite Centre (ISAC) guesthouse on September 19 when it had vacancies. The next day, when a Bharat bandh was observed, or on September 21, she carpooled with a few others and travelled to Antariksh Bhavan, headquarters of the Department of Space, some 20 km away, on New BEL Road. There she tried to meet three people and apparently had their exact names and designations. According to the police, Ms. Sam stays with her parents in Ahmedabad and is married to Alex Thomas, a high schoolteacher from Kollam, Kerala. A B.Com graduate with a diploma in pharmacy, she is unemployed and is being treated for depression. She used to visit her husband in Kollam and go missing before returning to Ahmedabad after a few days. As this habit had become frequent, her family members stopped bothering and did not report her disappearances to the police. This time round, she had been missing for 10 days. The story does not look credible – if she was indeed mentally depressed and went missing, how did she prepare a fake ID card ? – what were her intentions and what had she communicated to her bosses !!! it is stated that she has been booked under Sections 171 (forging the identity of a public servant with fraudulent intention), 448 (trespass), 471 (forgery), and 420 (cheating) of the Indian Penal Code. Only last week, we read about the ISI-sponsored espionage module busted with the arrest of 35-year-old Thamim Ansari in Tiruchi. According to an NIA official, the espionage module had raised apprehensions among law-enforcing agencies about the existence of more such operatives in this part of the country. According to police sources, two DVDs containing defence-related visuals were seized from him Ansari, who admitted to interrogators that he had sent a few ‘consignments’ to Sri Lanka through agents working for a Pakistan High Commission official there. It reportedly was a case of man in thick of public but clandestinely taking photos of establishments and religious places with apparent intent to cause harm. Preliminary investigation are stated to have indicated of the Ansari’s future assignment to cover the nuclear submarine facility at ‘INS Varsha’ and other Naval establishments in Visakhapatnam. He reportedly hails from Thanjavur where he is living with his wife and son. A former activist of the Students Federation of India, affiliated to the CPI (M), Ansari was also a member of Rotary Club. In an apparently unrelated but one of grave concern, a powerful bomb exploded in the office complex of ‘M Sector’ (army office) in the heart of Manipur capital complex here at 5.30 am this morning of 25th Sept 2012 - no casualty was reported, official sources said. It was not yet exactly known how the bomb went off at the heavy-security complex adjoining Manipur Raj Bhavan and prestigious Johnstone Higher Secondary School, the sources said. Official sources refused to divulge any information when asked whether the bomb was hurled at the four-cornered wall complex by insurgents from roadside or an accidental explosion of grenade or bomb kept inside the army complex. A mentally challenged woman, creating fake ID cards wanders to high profile zone, another man living like a commoner, takes photos, videos and sends them to our enemies, bomb explodes near army office – all things not good for the country; stringent action needs to be taken and strong punishment handed out to the perpetrators and those who harbour them. T20 WC match of today assumed undue importance as this was an eliminator – WI after scoring so much against Australia, lost the match partially due to rain when they fancied their chances of winning so much. Today at 10.30pm, the match between West Indies and Ireland stands abandoned – with both the matches curtailed due to rain, WI could well have been sent back home by the monsoon weather. Today the match was at Ranasinghe Premadasa Stadium named after Former Lankan President [earlier known as Khettarama Stadium], Colombo. Today, when play was possible, WI placed themselves in an excellent position restricting Ireland to 129 for 6- Gayle took 2 wickets and celebrated them with calypso dance. Darren Sammy won the toss and and inserted Ireland, West Indies enjoyed the perfect start. Fidel Edwards struck with the first ball of the match, a swift, inswinging yorker that proved too much for the Ireland Captain. Funny are the rules, WI scored 192 and restricted Ireland to 129. The record book would reveal : Australia 2 points; WI 1 point qualified with a better NRR than Ireland. They conceded scored 83 in 9.1 [actually they scored 192] and conceded 100 in 9.1 – not to take cognizance of the 129 in 19 overs today……… they may not complain, as this has taken them over Ireland. Getting back to today’s match, the Irish Captain William Porterfield is a veteran of 60 One dayers having scored 1752 runs with 5 centuries and 8 50s. he has played 29 T20 Internationals making 475 runs with 56 as his highest. If you can recall in the ICC WC 2011 in match no. 3121 on 6th Mar 2011 against India at Bangalore, he top scored with 75. Sri Lanka he would sure like to forget – not only his team got eliminated, he had the ignominy of not scoring a single run and not surviving the first ball. Today he took strike to Fidel Edwards – the ball pitched up, swung back, went through the gate, via the toe of the boot and disturbed the stumps. Porterfield out for a duck, failing to disturb the scorers. Against Australia in their earlier match, the very first ball of the match, Shane Watson dropped it short, Porterfield hooked it, got a top edge and was taken in the long – out first ball without scoring. 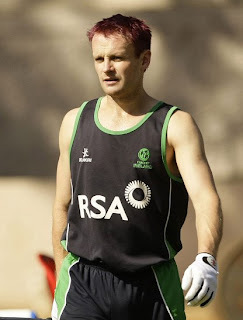 That is - William Thomas Stuart Porterfield, opening batsman and Ireland Captain. Now he has been dismissed first ball 7 times – 5 in T20s and 2 in ODIs. 24th Sept. 2012 @ 10.45 pm. Comparisons could be invidious ! Safety is everybody’s concern – one must take precautions but avoiding or stalling some project can never be construed as a safety measure. The good news is that the Nuclear Power Corporation of India Limited (NPCIL) has begun loading enriched uranium fuel rods in the first reactor of the Kudankulam Nuclear Power Project (KKNPP) following a green signal from the Atomic Energy Regulatory Board (AERB). There is news that the Board granted its final approval for loading of 163 fuel assemblies containing about 80 tonnes of low enriched uranium fuel on Tuesday evening, after the NPCIL had fulfilled all the stipulated conditions. It is stated that the Unit could go into operation in about three to four months after several rounds of tests. The nuclear plant, with two units of 1,000 MW capacity each, built with Russian collaboration has been impeded at various levels, mainly due to the protests organized from religious precincts of Idinthakarai, by a group allegedly receiving vast foreign donations. A group has been manipulating and fighting with diversionary tactics and have threatened invasion in to the plant itself. In earlier stages, they ridiculed the most respected President APJ questioning his knowledge and sincerity and recently, they organized a protest at sea, which reportedly took the security cordon by surprise. 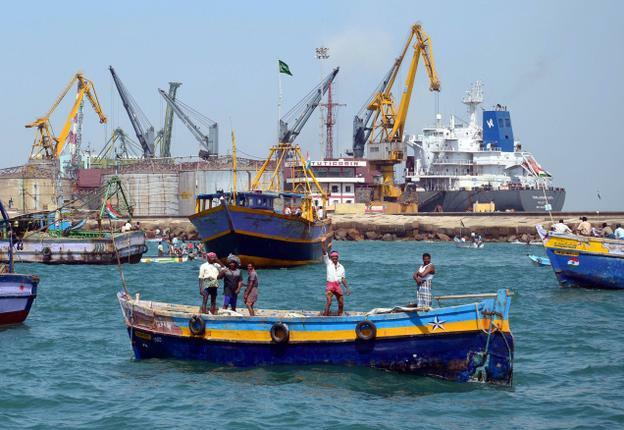 The protestors wanted commissioning of the plant to be stalled and with this sole demand, a large number of fishermen sailed past the Tuticorin coast with a fleet of more than 700 boats in an attempt to lay siege to the approach channel of the V.O. Chidambaranar Port, condemning the Central and State governments for their stand on the issue. They also demanded the withdrawal of the police force from Idinthakarai, withdrawal of cases registered against the protesters and relaxation of prohibitory orders under Section 144 of the Criminal Procedure Code by the Tirunelveli district administration. One of their arguments is that a Nuclear power plant is risky and could cause trouble – the Govt. for sure have to address the concerns of the common public. By the same yardstick, no group has the liberty to question the motives, ask for details that would affect the safety security of any plant – that the protesters demanded detailed plans of the plant does not augur well. Many of them quote the accident at Fukushiuma reactor at Japan – there cannot be comparisons and the authorities have made it clear that safety has been accorded prime importance and foolproof measures have been taken. The protesting group are not prepared to buy these and are keen on stalling the commissioning. There have been road, rail and plane accidents but that never dithered people from travelling from place to place. One has to address the problem areas, take safeguards – but ships can never be made to stay all the time in Port because they are safe over there ~ whatever be the risks, they have to venture in to the highseas, for ships are built to sail and not stay in Port. 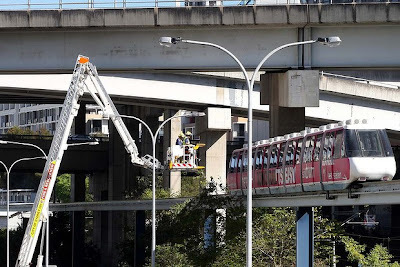 This is no direct comparison but the news of rescue operation in Monorail at Sydney following a power outage makes an interesting read. The Metro Monorail is a single-loop monorail in the city of Sydney, Australia, that connects Darling Harbour, Chinatown and the Sydney central business and shopping districts. There are eight stations on the 3.6 kilometres (2.2 mi) of track, with four trains operating simultaneously. It serves major attractions and facilities such as the Powerhouse Museum, Sydney Aquarium and Sydney Convention and Exhibition Centre. The train is run by electric power supplied at 500 V AC via a sheathed conductor below the running plate of the track. A control rail is also provided for train control, and a generator is provided to clear trains from the track in emergencies. Each station stop takes 40 seconds, including the time to decelerate, board passengers, and accelerate again. With all these, will the train suffer any trouble ? – can any system be fool-proof !! It stopped midway caused by a fault in power cable, leaving passengers high and dry. 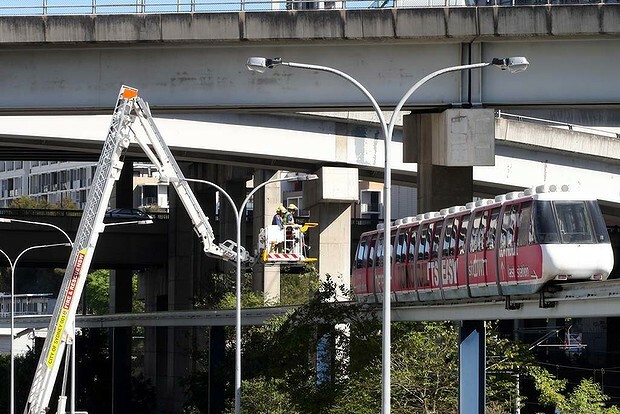 One Monorail train set stopped between Darling Harbour and Chinatown. Another stopped near Sussex Street. 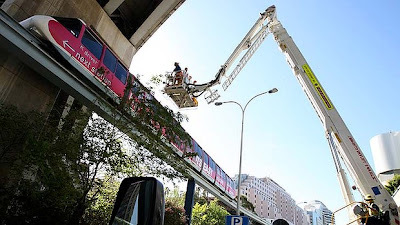 Firefighters, police and ambulance crews were rushed to two monorail sites today [24th Sept. 12] Some passengers were reported to be suffering from the heat inside the monorail cars which also lost air-conditioning when they stopped. Two cherrypickers were brought in at the two sites, one at the corner of Day and Liverpool streets near Chinatown and the other on Darling Drive by the Darling Harbour convention centre. The electricity provider says a fault on an underground cable caused the outage shortly before 2:00pm and power was restored about 4:45pm local time. 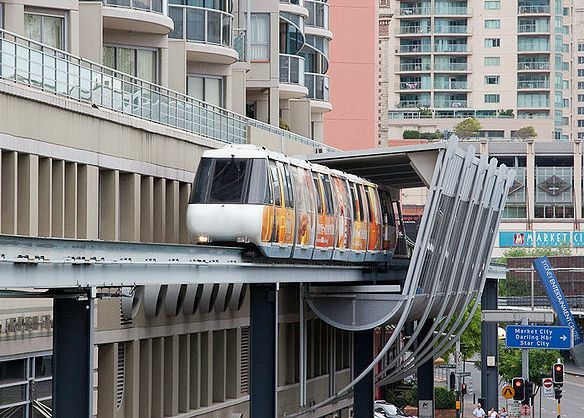 Newspaper reports suggest that around 100 customers in Pyrmont and Darling Harbour were affected. At 3.30pm, fewer than half the passengers on board had been removed from one train, stuck between Darling Harbour and Chinatown. There reportedly were a number of children on board, marking the first day of school holidays, but parents and grandparents said the mood remained calm. Cricket is no Science … it is not simple Mathematics or logic either. India struggled against minnows Afganisthan and England thrashed them – so when England met India in an inconsequential match, some had predicted that England would prevail easily over the struggling Indian bowling attack. Stuart Broad made just one change – while Dhoni chopped the team and experimented with 4 changes. Ashwin, Sehwag, Zaheer [who was recently spoken at bowling Sachin] all sat out. Kevin Pietersen on mike said – Broad wants to maintain England’s winning ways – ‘winning is a habit’ and he is not prepared to lose; Dhoni has made up his mind to provide chances to his bench, perhaps not an attempt to win !! The era of Greg Chappel can be summarized as putting to difficulty Sachin, Sehwag, humiliating Ganguly and sidelining Zaheer. The only solution was hype the image of Irfan Pathan, the all rounder, who would open the bowling and bat one drop. Ironically, is the same formula working once again… Pathan opens the bowling, no Zaheer, no Sehwag and he opened up the batting too yesterday. Bhaji came back after 1 year recluse in place of Ashwin who has been performing consistently and extraordinarily. Is Harbhajan Singh - the solution to India's World Twenty20 bowling problems, or just a spin bowler enjoying the simplest of comebacks against a hapless England side? India thrashed England by 90 runs and Harbhajan, in his first international for more than a year, finished with 4 for 12, the best bowling performance by an Indian bowler in Twenty20 internationals, and the Man-of-the-Match award. 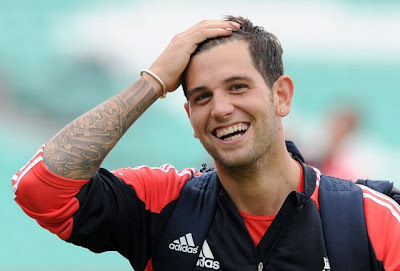 Jade Dernbach is a very modern cricketer. Earrings on both ears, tattoos covering each arm and words to accompany each delivery. He did nothing exceptional and bowled a poor last over, straying all over, still letting out expletives and questioning the Umpire’s wisdom calling wides. Yet he got away, being an Englishman and his arrogance would be put as spirited display !! At Premadasa Stadium, Colombo, England won the toss and chose to field. When Kohli got out India were 82 after 10.3 overs, a score of 170 was not the toughest of the targets. Kohli and Gambhir made runs but it was entirely an opportunity made out for Rohit Sharma, who despite so many failures continue to get call overlooking Manoj Tiwary, Rahane and others – could bat above Raina and Dhoni and had so much opportunity and time to settle down and made runs at last. The score card would read India 170 for 4 (Sharma 55*) beat England 80 (Harbhajan 4-12, Chawla 2-13) by 90 runs. The result would be insignificant in T20WC but was heartwarming for Indian fans, denting England’s ego. England's first error was to misread the pitch. While India included two specialist spinners, England dropped Samit Patel to make way for the extra seam option of Tim Bresnan. England's final total of 80 was their lowest in T20Is, surpassing the 88 they managed against West Indies at The Oval in 2011. The margin of defeat is also the largest, in terms of runs, England have suffered in T20Is and the largest victory inflicted by India. Harbhajan Singh's 4 for 12 is the best bowlingperformance by an Indian bowler in Twenty20 internationals surpassing RP Singh's 4 for 13 against South Africa in 2007. Harbhajan's performance is also the fifth-best in the World Twenty20. Piyush Chawla joined the party enjoying England's clueless batting. Jonny Bairstow, reading the googly as if it were in Greek, missed a slog-sweep, while Craig Kieswetter, his foot nowhere near the pitch of the ball, was undone by a legbreak and edged to slip. It was, by any standards, a dreadful performance with the bat. Back home, if some were listening, Irani Cup is on at the Chinnaswamy Stadium as, expectedly, Rest of India's batsmen piled on the runs against Rajasthan. M Vijay batted to glory, reaching the highest individual score in the tournament's history, beating a 22-year-old record held by Praveen Amre, to pretty much ensure the Ranji champions would be denied the Irani Cup for a seventh year in a row. Way back in Nov. 1990, against Bengal, ROI had declared at 737/7 with Ravi Shastri the captain making 217 and Pravin Amre made 246…………… but would the Selectors or anybody else seriously make a note of this match or of the classy Vijay innings !! Lamborghini recall - possible fuel leakage ! the dangling black rhino - .. ! !